Grandchildren deserve equal time, and grandson Joel, 6, had his “little hour” yesterday, so it's time for the one and only granddaughter Kimberly to be onstage. Kimberly will be 18 in three months, and she’s one of those artists who characterize a parallel relationship between visual art and culinary art. For Kimberly, cooking is as much an art form as her painting, and she’s hypersensitive to the details and flavors that create quality cuisine. Kimberly began painting one summer while I was visiting in California. We had begun experimenting with drawing and painting a small mural within a large, unsightly crack on the concrete wall enclosing one end of the backyard pool. Despite the jeers of her big brother Troye and her cousin Martin, whom I chased away, we created a desert landscape in the small space, and Kimberly became hooked on art. She has taken private art lessons for years and has won numerous Grand Prizes at the Antelope Valley Fair in California. Several of her paintings, including a portrait of me and my sister Sidney Sue that she painted from an old childhood photograph, hang on my walls here in New Iberia, Louisiana and at Sewanee, Tennessee. Kimberly began cooking seven years ago, and when I went out to Palmdale one Thanksgiving, I made her my sous-chef, a position that required her to clear away and wash pots as we progressed with meal preparation. Too much dishwashing inspired her to advance to chef, and her mother Elizabeth has become sous-chef. Kimberly and Elizabeth have collected a library of cookbooks to equal that of my Godmother Dora Peacock who collected recipes, rather than cooked gourmet dishes. My godfather Markham Peacock donated the collection to Virginia Polytechnic Institute after she died (you can Google the name "Dora Greenlaw Peacock" to find out more about the collection). Two years ago, when Kimberly visited New Iberia at Christmas, she prepared a Cajun chicken and sausage gumbo that could have won ribbons at the New Iberia Gumbo Cook-off, and we have since begun giving her Cajun cookbooks. The artist/chef connection fascinates me, and Kimberly is in good company. The impressionist painter Monet kept voluminous cooking journals and provided recipes for his table at Giverny, France. He loved food that was fresh and in season, and with his wife Alice, served beautifully-prepared dishes for notables like the painters Renoir and Pissaro, sometimes presenting pike from his own pond and vegetables and herbs from his kitchen garden. If he served mushrooms, they were picked before daylight before they could be presented at his table. Several of Monet’s favorite paintings, such as “The Breakfast Table,” “Luncheon," and “Luncheon on the Grass” reflect his love of food and its artistic presentation. Some of Monet’s artist contemporaries, Cezanne and Millet, were also food lovers and served artistic dishes such as bouillabaisse (Cezanne) and petits pains (Millet). 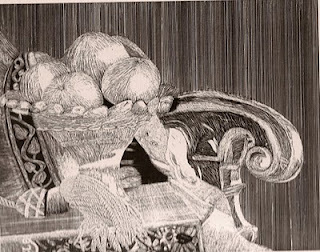 Kimberly’s art career is in its infancy, but she garnered a Grand Prize for a painting of food -- her still life of fruit arranged in an ornate bowl. She always cooks with fresh ingredients, disdains packaged food, and is very fussy about her meals. When she visits Louisiana, she discards her diet regime – one that focuses on nutrition and a slim body – and indulges in shrimp and crawfish dishes. When Kimberly is asked to cook, she says simply, “Select a recipe and I’ll make it – anything.” However, we know better than to select one that contains packaged ingredients. She makes a family favorite, Baked Spaghetti, which she’s preparing for seven of us tonight. It’s a common-sense recipe that Elizabeth enjoys on her birthdays each year. Kim also bakes and has a certain predilection for chocolate. We have an apron ready and have scoured the kitchen, anticipating this chef’s arrival. Vive le food art! Note: The paintings in this blog are Kimberly's work. The chimenea about which I wrote last month finally fostered a good fire during Christmastide. Joel, my six-year old grandson who is visiting from California, inspired us to build a roaring fire in the pot-bellied chimney on the patio, and it provided a few hours entertainment for us on a chilly December day. After Joel helped Vickie build a fire with pinion wood, he gathered pine cones and sweet gum balls to stoke the blaze by dropping them down the chimney. We sat around the fire and drank hot tea with honey and lemon, a drink that Joel had never tasted. He was introduced to tea time and sat quietly watching the flames and sipping his tea. Last year when Joel visited, he wasn’t as composed, and I’m amazed at the rapid changes in child development that take place within a year. Last year, he wriggled, tapped his feet, ran around the living room -- was a child in perpetual motion. This year he’s a little old man who has learned to sit at the table, use a knife and fork with dexterity, and join in table conversation. When he tires of adult talk, he asks to be excused and amuses himself with the figures in my manger scene, creating a drama of his own by talking all the parts of the figures at his station behind the TV set where no one can hear the dialogue of characters in an imaginative play he has created. “Do you think your grandmother is Dr. Phil?” someone asked, and we laughed again. “Don’t hold back,” another family member quipped. Joel was nonplussed. “Well, what do you think I should do?” he persisted. Someone told him to punch the girl back (which my daughter Elizabeth has encouraged Joel not to do), and I suggested that he inform the mothers. “Hmph,” Joel said. “The little girl’s mother doesn’t even tell her to stop at first. She just says that’s the way she plays with other kids.” The matter was never settled because for the most part, we’re non-combative people and didn’t want to encourage fighting, but my grandmother instincts almost overcame me. I wanted badly to tell him to punch back. Instead, we insisted that he talk to the mother again. Such are the trials of Joel at six years old, and since he’s home schooled, his exposure to bullying is minimal. Stomach punches are new to him, and hitting is offensive to all of us. Joel has a slight build and as a “preemie” weighed in at four pounds when he was born. I flew out to California to help deliver him six years ago and feel deep kinship with him. He had great composure when he told the story of his struggles with an aggressor, but he sensed that he was in a sympathetic climate and confessed his problems in a wry way. We stifled laugher, knowing that in the process of socialization (unfortunately) Joel will meet many more aggressors and people who possess ill will, although most of that will be expressed verbally–in every arena, including church groups, perhaps especially in church groups during the last decade. When Joel departed for the night, he took with him packets of decaffeinated tea, honey, and a huge prize lemon Judge Anne Simon had given us after a tea party in her home during Christmas. Every day, Joel arrives, asking for a cup of tea, and we wonder if it was really the soothing effects of tea after the “Dr. Phil session” that caused him to appear so becalmed when he left us. Yesterday, he reported that one of the aggressors had left, and he had experienced resolution without confrontation. We had prayed for that happy conclusion! 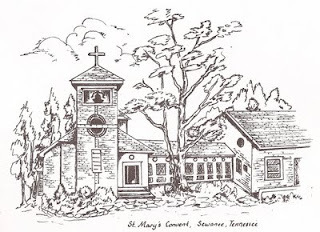 Charlie Brown, Lucy, and other “Peanuts” comic strip characters often people the sermons I deliver at both the Episcopal Church of the Epiphany in New Iberia, Louisiana and at St. Mary’s chapel in Sewanee, Tennessee. The strip runs in over 2,000 newspapers and has inspired a book entitled THE GOSPEL ACCORDING TO PEANUTS by Robert Short in which this author writes about theological themes that occur in the cartoon strip. I confess that I find these themes also, and I’m always referring to Lucy as the ultimate anti-Christian because she debunks the behavior of her friends, especially Charlie, and emerges as a thoroughly spiteful character. This Christmas, my friend Janet Faulk (author of ROAD HOME), gave me a biography of Charles Schulz written by columnist and reporter Rheta Grimsley Johnson entitled GOOD GRIEF: THE STORY OF CHARLES M. SCHULZ. I was pleased that the book was personally inscribed by the author. Rheta is remembered by New Iberians as the author of a book about Cajun country entitled POOR MAN’S PROVENCE published in 2008. Rheta often enjoys trips to this area to visit her good friend Greg Girard, eminent photographer of the Atchafalaya Basin. 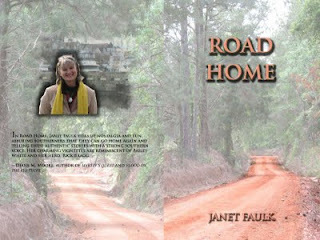 My friend Janet has also met and befriended Rheta and admires her unpretentious writing style. Rheta lives in Iuka, Mississippi, a town of nearly 3,000, in northern Mississippi near the Alabama border (which is an attention getter for Janet who is a native Alabaman). She’s won a plentiful number of awards, including the National Headliner Award for Commentary in 1985, the Scripps Howard’s Ernie Pyle Memorial Award for outstanding human interest reporting in 1984, the Scripps Howard Writer of the Year from 1983-1985, and in 1991 was a finalist for the Pulitzer Prize for Commentary. I like Larry King’s remark about Schulz’s characters being in all of us – a point that I often make in my sermons when I invoke Charlie Brown. I also liked Rheta’s comment that rejection is Schulz’s specialty… “he has spent a lifetime perfecting failure.” Indeed, the characterization of Charlie Brown bears out the remark, and Lucy is a strong supporter of that failure. In GOOD GRIEF, Rheta tells about Schulz’s wartime experiences, explains how Charlie Brown came into being, and describes his life-long battle with depression and agoraphobia. Again, Charlie Brown reflects that struggle in “Peanuts.” The book is a very honest, intimate account of Schulz’s life, and Rheta presents the paradox of Schulz in a graceful, insightful manner. This biography is complete with family photos and is a “must read” for lovers of “Peanuts.” Rheta has earned many cudoes for her accessible, charming style of writing, and I look forward to reading more of her stories centered in the South. Last year about this time, Border Press reviewed the text and illustrations for a children’s book entitled THE BEAST BEEZLEBUFO, which I had written and Benjamin Blanchard (I call him “Ben German”) of Lafayette, Louisiana had illustrated. For a year, a whole lot of dickering with a program that would accommodate the color illustrations and cover transpired, and, finally, a few days ago, the printer informed us that a proof will arrive next week. For Ben’s sake, I’m hoping it’ll be delivered by Tuesday, at the latest, because I think the first proof will make a great Christmas gift for both of us. My collaborator Ben, a young man in his twenties who now lives in Sedona, Arizona, is a certified raw foodist. He spent a summer training for certification with Tree of Life in Patagonia, Arizona and worked with this organization after he graduated from his schooling. I’ve known Ben since he was a baby and have watched him go through various stages of drawing and painting, an interest in film, and, finally, raw food preparation, at which he still works. However, he also seems to have found his niche as a children’s book illustrator. For many years, Ben and I have shared a love of Peanuts and the antics of Charlie Brown, a passion that often inspires me to include Charlie in my sermons. Ben’s mother, Janet Faulk (author of ROAD HOME),has provided Charlie Brown books for Ben since he was a toddler and has nurtured his passion for drawing and cartooning. We’re holding our breaths that the proof of THE BEAST BEEZLEBUFO will properly showcase Ben’s art in the final printing. The book is actually a poem that I wrote for my grandson, Joel, 6, who lives in arid southern California. Joel has a passion for reptiles, and I thought he’d be fascinated with the story of this giant prehistoric devil toad that was discovered in Africa over a year ago. Perhaps I’ll be able to show the proof to him at Christmas. THE BEAST BEEZLEBUFO is a short poem, and the story of its history and size inspired Ben to do some wonderfully-whimsical drawings for THE BEAST BEEZLEBUFO. Last year before Ben left for Arizona, we discussed details of the poem and illustrations that would go into the book over a cup of coffee at a Starbucks café in Broussard, Louisiana. We spent three hours sparking each other’s imagination. I love working with a young artist who has esoteric tastes in art and literature. Ben’s now doing illustrations for a long poem about the moon that he wrote, a copy of which his mother shared with me a few days ago. It’s delightful! The droll illustration shown above is a copy of one of the pages in THE BEAST BEEZLEBUFO. Our hope is that the book will be available at Amazon.com by the 15th of January. It will also be listed at borderpressbooks.com. 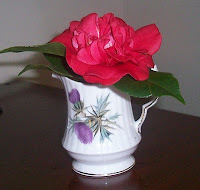 The sight of a winter-blooming red camellia in a vase on the breakfast table gives me a morning boost during this gloomy week of Louisiana monsoons. This morning’s “pick” is a beautiful blossom gathered from my daughter’s yard, and what a treat to find flowers blooming in December! Over fifteen years ago, I was commissioned by Live Oak Gardens Foundation and Acadian House Publishing to write the text for a book about Live Oak Gardens at Jefferson Island, Louisiana. While researching the book, I spent many days in the gardens, enjoying the varieties of camellias displayed in “generous levels of light,” as I wrote in the book, LIVE OAK GARDENS, A PLACE OF PEACE AND BEAUTY. I was fascinated with the gardens planted by J. Lyle Bayless, Jr., the original owner and designer of Live Oak Gardens (then called Rip Van Winkle Gardens). When Bayless first saw a red camellia in Jackson, Mississippi , he was enchanted with the beautiful flower, and his interest was further stimulated at a demonstration about grafting camellias given by his friend, E. A. McIlhenny, creator of Jungle Gardens on Avery Island. In 1917, Bayless purchased Jefferson Island, and his interest in camellias burgeoned when he saw the Jeanerette Pink Camellia which grew in the front yard of the Joseph Jefferson mansion on the island. In 1952, he began clearing the land around the Joseph Jefferson home and planted it with numerous varieties of camellias and azaleas. He also designed a 1 1/2 mile live oak avenue leading up to the gates of the Joseph Jefferson home. After Bayless’ plantings were destroyed by several freezes and hurricanes, he commissioned Geoffrey Wakefield, an English horticulturist, to develop Rip Van Winkle Gardens. Interestingly, Wakefield had lived at Haver Castle, birthplace of Anne Boleyn and was the son of the head gardener for Lord Astor. On Jefferson Island, Wakefield designed many small gardens joined together with a circuitous path, importing plants from throughout the world, particularly camellias. His assistant, Mike Richard, eventually became the Director of Horticulture for the island gardens. Bayless continued to expand his camellia garden and won more than 1,000 prize ribbons at southern flower shows. He also hybridized many camellias, naming a prize white camellia “Elizabeth” after a relative. In 1978, Bayless donated the tract that comprised the gardens and the old Jefferson Home to Live Oak Gardens Foundation and built a home for himself at the edge of Lake Peigneur. On November 20, 1980, oil well workers, who were drilling under Lake Peigneur, punctured the roof of the salt dome on the island, causing Lake Peigneur to drain into a mined-out cavity, and as the lake drained, the ground around it caved in. The lake swallowed up 65 acres of Live Oak Gardens, including greenhouses, thousands of plants, and Bayless’ lakeside home. Bayless retired to Maui, Hawaii where he enjoyed the abundant plant life until he died in 1985. Today many varieties of camellias can still be found at Live Oak Gardens on Jefferson Island, and visitors from all over the world continue to enjoy J. Lyle Bayless’ legacy of a luxuriant garden on an island rumored to have been frequented by Jean Lafitte and his buccaneers. You can read further in LIVE OAK GARDENS; A PLACE OF PEACE AND BEAUTY, published by Acadian House Publishing and available at Live Oak Gardens, Jefferson Island, Louisiana. the crumbling margins of the acceptable. on the threshing floor of the world. a link of joy and loss. all who would assassinate one another. My poetry mentor, Darrell Bourque, cuts a wide swath in the national and international literary world, but his subjects are born in the provincial atmosphere of small town south Louisiana. In his home tucked away behind a bamboo hedge near Church Point, he emerges as a man who exemplifies Louis MacNeice’s description of a poet–“an extension of …a concentration of… the ordinary man.” Darrell resides where he has lived most of his life–in the frame house in which he grew up, located between two towns: Sunset, which was briefly the sweet potato capital of the nation at the turn of the century, and Church Point, the Buggy Capital of south Louisiana and home of the Cajun Woodstock. Traveling north of Lafayette toward Sunset, my friend Vickie and I observed that the countryside was flat, prairie-like pastureland, a pastoral place where quarter horses were being trained and Hereford cattle grazed. After living on The Mountain at Sewanee for three years now, the flatness seemed more flat than I remembered. We turned off on Jessie Richard Road, almost immediately sliding into the drive beside a bamboo hedge that entirely surrounds the home of Darrell and Karen. The bamboo, which Darrell planted in 1975 as a wind break and for privacy, hides a lovely rose-colored frame house with bright blue shutters and blue tin roof, colors straight out of the heart of the French Quarter. We crossed the cobbled brick patio and were greeted by the Bourques and Sam, a Jack Russell terrier who moaned like a good Baptist during most of the visit. After the traditional Cajun bussing and hugging, we entered a home filled with art treasures—paintings by Lynda Freese, Clementine Hunter, John Hathorn, Dennis Williams and others. The crown of the collection is a painting entitled “Arnaudville,” by former ULL history professor, Gloria Fiero. Through the courtesy of Dr. Fiero, this painting became the cover for Darrell’s newest work, CALL AND RESPONSE. Darrell had been fasting, so we didn’t linger long viewing the gallery of art and Karen’s studio, and sat down to eat at a festive table decorated with a Christmas table cloth. Except for the piece de resistance --a flourless chocolate cake his wife Karen had made according to a recipe by Emeril -- Darrell had cooked the meal: salad with pomegranate seeds and pine nuts, pork roast, couscous, a casserole of Darrell’s own concoction: roasted red peppers, zucchini, and yellow squash, purple onions, seasoned with garam marsala and, of course, Tony Chachere seasonings. Karen passed around a basket of nahn that Darrell claimed to have included with the meal because of my sojourn in Iran. I asked him to say grace to “give me a rest,” and he said a simple thanksgiving for friendship and food, Buddhist style. A former Roman Catholic, Darrell recently took his first vows as a Buddhist in the Shambala tradition. Mealtime is a time of celebration for most people who live in Cajun country, and this one was no exception. The two hours spent at the Bourques’ table was a time of conviviality and friendship, and we talked about old friends and shared experiences, eventually turning to poetry and Darrell’s latest work. I asked him how Buddhism had affected his poetry, expecting a complicated exposition on the influence of Buddhism, but he answered simply, “it has had a subtle effect,” explaining that the entire idea of non-attachment has affected his art. “I’m less attached to ’finished product,’” he explained. “When I write something, I get rid of the attachment to what I think is good. Sometimes, something you think is good is not. A good poem still has merit but what you may consider to be a bad poem also has merit.” I laughed and said I felt better about writing a plethora of what I consider to be bad poems during the last fifty years. Darrell has been writing poetry for over forty years, and I’ve followed his work since the early 80’s when I wrote a feature article about him for “The Daily Iberian,” and, a few years later, introduced him at a poetry reading in the New Iberia Library. In 1989, I enrolled in a Creative Writing course at ULL that he team taught with Dr. Carl Wooton, and filled one of the thickest portfolios of poetry I’ve ever written during a five month period. No doubt about his teaching abilities—he is inspiring! In recent years, I’ve begun to realize that he isn’t just the perfect Poet Laureate of Louisiana, he could achieve the position of Poet Laureate of the United States. After reading his two latest books of poetry, which he gave me before we left, I’m even more convinced that my evaluation is accurate. CALL AND RESPONSE, Conversations in Verse, which Darrell and Jack B. Bedell, poet and director of Louisiana Literature Press, wrote together, is a collaborative work of two voices telling stories in lyrics that range in location from rural Louisiana to exotic places in the Far East and Europe. 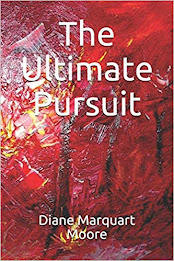 The book was written after Bedell contracted West Nile virus and during his illness realized that to heal himself, he needed Darrell to “help him make poems again.” The resulting work carries an explicit message about Darrell’s love of communicating. 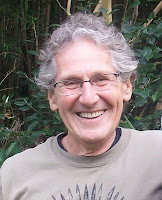 In the introduction, Darrell writes: “Poetry is for me one form of conversation. It is a way of talking back and talking into things–talking back and talking into memory, and ancestry, talking into the geographies I inhabit and the family I am part of; talking back at calamity and experience; talking into relationship, talking back and talking into the languages that have shaped my understanding the world I live in; talking back and talking into history; talking into possibility and into hope.” There, he says it all in one short paragraph—his credo as a poet! The collaborative style of these two poets in CALL AND RESPONSE was based on the chants that workmen used when they were picking cotton, digging ditches, and doing other physical labor. One worker would sing a call, and the other workers would respond in song. 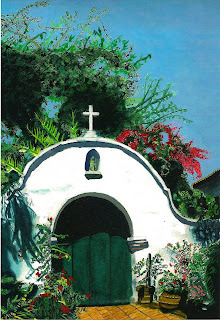 The poem that resonated with me and virtually came alive, when I saw his wife Karen’s stained glass rendering of it, was “On An Overgrown Path,” a remarkable poem of love for Karen to whom he has been married 46 years. In fact, Karen was the surprise of the visit. I knew that she worked in stained glass, but I wasn’t prepared for the stunning brilliance of her work–it’s an exquisite match for Darrell’s poetry. We toured her studio in a guest cottage behind the house, a small workroom where she carries out what she calls her “spiritual work.” . Karen is largely self taught; however, she also studied with Dave Temple who owns Acadiana Art Glass. Only a few pieces remain in the studio because she sells or donates almost every piece she creates. One arresting stained glass window of a chubby African angel caught my eye, but equally brilliant were her floral renderings, mandalas, and madonnas. 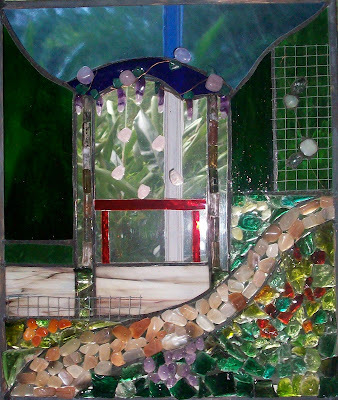 Each piece of glass she inserts into the windows depicts a spiritual value, of which she is unaware until she finishes the piece and then researches the meaning of the colored stone or glass she has used. Karen says she is guided by some force that takes over and illuminates the work. The poem that inspired the jewel of her collection, shown below, was Darrell’s “On An Overgrown Path,” dedicated to her. now, this table we took our meals on. through it, dropping petals in our plates. 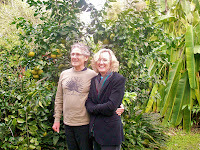 After the studio visit, we followed a path into the Bourques’ winter garden, a paradise of holly trees, ginger trees, banana plants, camellias, Louisiana sweet orange, grapefruit, and lemon trees, and crepe myrtles flanked by several bronze sculptures done by William Lewis, a sculptor now living in Arnaudville. Darrell and I posed, arms linked, for a photo taken in front of a sculpt depicting a poem by Rilke, but I disappeared myself from the results, as he looked more appropriate standing alone beside his favorite sculpture. We visited three hours and left only because Vickie had to give a report for a Solomon House meeting. But we’re going back, at their invitation. They issued the call, and we’re responding to it! It will be a good departure point before we wing back to Sewanee. I feel the inadequacy of words when I say that being with the Bourques is an experience of being with two gifted people who have not only mastered their art but have mastered the art of living well. My good friend, Morris Raphael of New Iberia, has many talents, the most well-known one being his skill to write books about Teche country and a column in “The Daily Iberian.” However, he’s also a unique artist who has designed post cards covering Civil War battles in the bayou country that showcase his deftness in drawing. Raphael sketches the intricate details of battles that he has also narrated in BATTLE IN THE BAYOU COUNTRY and A GUNBOAT NAMED DIANA, two of a dozen or more books he has written. The postcards are miniature, vividly-colored drawings that should attract the attention of Civil War buffs and warrant framing, which one of Morris’s sisters-in-law in northern California has done. I keep my postcard collection atop a bookcase in my study and am considering framing them as a Christmas gift to the house here (that’s the newest narcissistic rage – giving yourself a Christmas gift!). The postcard that particularly attracts me is that of the Yankees converting the Episcopal Church of the Epiphany into a hospital, showing one of the pews that has been removed from the church being used as a feeding trough for horses. Several of those pews were salvaged, complete with the horse’s teeth marks, and remain in the back of Epiphany Church. They’ve outlived threats to sand and restore them to shiny new pieces of church furniture. Another colorful postcard depicts General Banks celebrating the Yankee occupation of the David Weeks mansion, now known as The Shadows on the Teche, a property of the National Trust. Raphael’s mini history on the back of the postcard describes Banks riding horseback through the dining room of the old mansion. According to Raphael’s WEEKS HALL: THE MASTER OF THE SHADOWS; Mrs. Moore, who had become wife of Judge John Moore after her first husband David Weeks died, fled to the attic of The Shadows because she refused to take the oath of allegiance to the United States. She became a prisoner in her own home, and as is revealed in WEEKS HALL, “General Banks and his staff did everything that they could for the mistress of the house, but she would have none of it and moved to a room in the garret on the third floor, remaining there in willful seclusion…” The First Lady of the Shadows died in 1863 and was buried in the southwest corner of the ground between two magnolia trees. Many of the cards depict scenes around New Iberia, including the Rebels repulsing Yankee invasion at Bayou Petite Anse, Avery Island, Louisiana. The card reveals a Union plan to destroy the Avery Salt Mine that was thwarted by a small artillery unit positioned on the hillside. The Yankees were forced to retreat, carrying their dead and wounded back to gunboats on the bayou. Another postcard depicting a battle scene near New Iberia shows Confederate Col. William Vincent and his 2nd Louisiana Cavalry ambushing two Yankee cavalry units at the Nelson Canal bridge. According to Raphael, the Union advance was halted, leaving the road full of dead and wounded. Battles at Irish Bend near Franklin,, at Brashear City (near Morgan City), Vermilion Bridge, and at Cornay’s bridge near Pattersonville, Louisiana – these are a few of the skirmishes included in the postcard set and exhibit Raphael’s skillful draftsmanship and imagination. I’m happy to own a full set drawn by this talented friend. In 1979, Raphael received the Jefferson Davis award from the United Daughters of the Confederacy in recognition of his historical works. Now in his ninth decade, this New Iberia writer and artist continues to write a column for “The Daily Iberian” and feature stories for “Acadiana Life” magazine. He and his wife Helen live in a home with windows overlooking the fabled Bayou Teche, a stream which inspires many of his Teche country stories. When the rain falls in Louisiana, it falls heavily. My patio floods, the glass porch springs a leak, and at breakfast I stare out at darkness, praying that the gray slashes will soon stop. A friend sends me an e-mail, writing that she is lying abed with a virus and contemplating what she wants to do in 2010. Another friend sends me a comment on my blog about living “lightly,” with no attachment to “things” and admits that she would grieve if she had to give up any of her prized possessions. On a gray day, I agree with her, since many of the objects indoors–vases, lamps, rugs–reflect color and brilliance that comfort me. I don’t wish for the friend’s virus, but I feel the urge to return to bed and read. Instead, I go through more papers and journals. In my great-grandmother’s secretary, where I store some of my writings, I find journals written over ten years ago-journals that contain thousands of entries, some of which became poems published in at least ten of my books of poetry. Great-Grandmother Dora Runnels Greenlaw’s secretary is fit housing for the journals as she was a poet who died the night before I was born, and family members say that there was a literary transference. Such is the nature of superstitious Scots. I must have had more discretionary money at the time I purchased the journals because they have brown, black, red, and tan genuine leather covers with gilt-edged pages! Such presumption! I leaf through them and find a few readable snippets. I’m passing them on to readers who may be having the same rainy morning and are spending meditative time indoors. who chooses to dwell in isolation. the road will not change. memories rising in the curl of smoke. I’m always curious about the places where writers do their work and the manner in which the Muse comes to them. For me, the dining room table suffices – or a striped chair in the living room here in New Iberia, or a faded, red velvet antique chair in the bedroom of the cottage at Sewanee. My favorite place to entertain the Muse is in the passenger seat of a moving car, and I often think of taking a train trip so that I can write poetry while traveling at a high speed, hurtling toward some favorite spot in the U.S. (like California). Recently, I picked up a book entitled JOURNEYS OF SIMPLICITY, Traveling Light, a book that features writers who made an art of “unencumbered living” and the few things they took with them on journeys or to preferred writing habitats. My favorite vignette is the one about Annie Dillard who wrote her famous PILGRIM AT TINKER CREEK in a small cinder block room overlooking a rooftop next door and a parking lot. 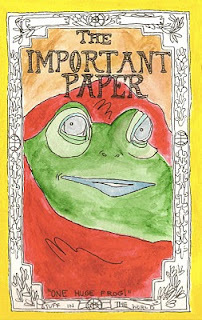 Dillard claims that writing is done best in “a room with no view so imagination can meet memory in the dark.” The list of objects she took to her unadorned room is short: books, quotes on index cards, various colored pens and yellow legal pads, and her brilliant mind. She reports that one day she closed the window blinds and never opened them again during the time she was writing the book. In the early 2000’s, Dillard set up a writing tent in the yard of her home on Cape Cod and conceded to using a computer, put down a rug, moved in a desk, chair, cot with mattress and took along all sorts of bird skeletons, stones, and whale bones. By taking only this sparse collection of objects into the writing tent, she felt free to invite the Muse daily. One of the most arresting essays in JOURNEYS OF SIMPLICITY was about the renowned chef M.F.K. Fisher who tells of WWII food shortages. She describes a cook named Sue who, at 70, lived alone in a deteriorating house that had “the scent of bruised herbs.” Sue spent less than $50 a year on food and wandered along cliffs and beaches, picking up weeds, sea spinach, pink ice plants, and kelp for salads that became legendary for taste and variety. 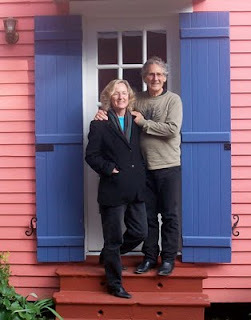 JOURNEY IN SIMPLICITY is a guide to simple living and provides a peek into the lives of writers, chefs, explorers, etc. who know what is essential to good living and what they took on their important life journeys. It’s written by Philip Harnden, a Quaker who lives in northern New York State. Reading this book inspires me to ponder how much baggage I think I need so that I can live the good life in two dwelling places–in a subdivision house here in Teche country and in a cottage on The Mountain at Sewanee. The implicit message in JOURNEYS IN SIMPLICITY is for us to learn to dispossess ourselves of so many things–to practice non-attachment. My excuse is that I like a change of scene, but, then there is that statement by Dillard about living in a room with no view so that we can meet imagination in the dark! During the holidays and throughout the past few years, I’ve heard enough ranting about the end of the world and how we’re living in the apocalyptic age to inspire my own rant refuting that subject. I think I hear a lot of fear mongering in the name of religion going on, but as I said at Thanksgiving, I prefer to enumerate blessings, so I’ll leave the end of the world to the fundamentalists and concentrate instead on present-day Joy, a fruit of the Spirit, St. Paul says…and, he adds, “the rest is dung.” Amen. There–that’s as close to a rant about naysayers as I’m going to write. If I’d had fifty cents more in 1963, my life might have turned out differently. Beauty queens are important in small towns, and they gain their titles in various ways. In my hometown of Clio, Alabama, the beauty queen nominees collected money in tin cans set on counters all over town; the kind you see in hometown grocery stores and locally-owned convenience stores. Votes were a penny apiece. In the first grade, my opponent in the “Homecoming Princess” competition was Carol Roberts. She was a pretty, prissy girl from a well-to-do family, plus she had more collection cans, strategically placed around town, than anyone else. My mother thought that it was fairly obvious what the outcome was going to be, and she just hated knowing that her daughter really didn’t have a chance to win. I have no recollection of how nominations came about, or how I ended up in the competition at all, except that I probably was as cute as any of the other little girls. I had a big dimple in each cheek and a spray of freckles that fell across my nose the way a sprinkling rain dots dusty porch steps. My light brown hair was fine and soft. I wore it pushed back with a hair band, the colorful plastic kind with big bad teeth, and the band let a little wisp of bangs slip out over my forehead so that when it was hot or when I was exasperated, I’d poke out my bottom lip and blow and my breath would make the soft hair dance. I must have been a popular girl because I remember boys would wait at the foot of the gigantic silver sliding board for girls to come flying down, and sometimes they waited for me. Actually, those boys had a bad habit of yanking dresses up as the girls would land square on their feet in the dusty sand at the bottom of the slide, but when they were told by the teacher that such conduct wouldn’t be tolerated, they went to cracking head bands, which may have been more socially acceptable but certainly was more painful. Popularity does come with a price. On the final day of the beauty contest, the money that had been collected, practically all coins, was poured out onto a table in the front of each class. The anticipation was high. When the judges counted the money in the first grade, I had lost the contest by fifty cents. I must have been a little disappointed, although I don’t remember it, but my mother was totally outdone with herself. She still has guilt about not adding another handful of change to my collection can. It’s probably just as well though, because I think that somewhere along the way, by some conscious need or unconscious act, we are issued lifetime tickets. These tickets are instrumental in defining who we are, how we are to behave, which experiences in life we are going to be able to take part in, and how we will synthesize these experiences. And, like an all-day-ride ticket at the state fair, there are always restrictions. Right away, the folks around you – relatives, teachers, and friends – become cognizant of the ticket you’ve been given, and during your formative years they keep reminding you of it. 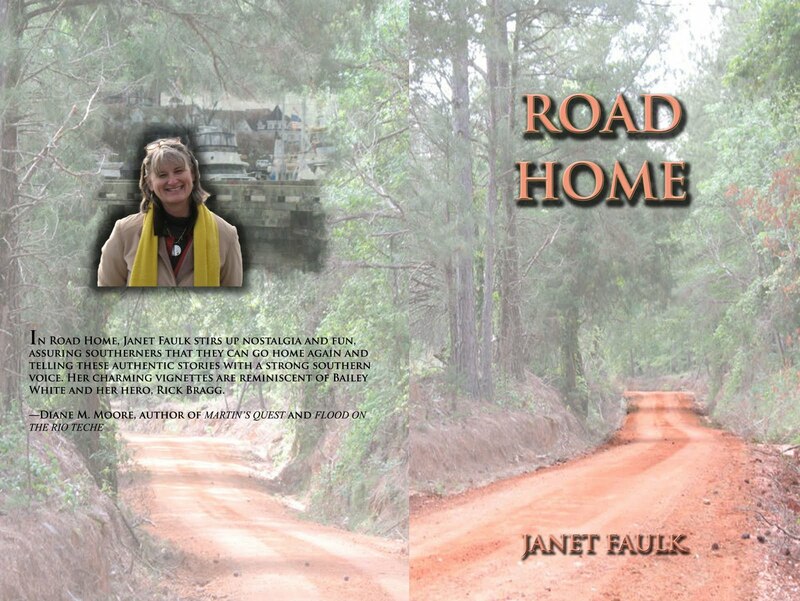 As I said on the back cover of Janet’s ROAD HOME, these stories are authentic tales narrated with a strong southern voice. Charming vignettes told with “wisdom and delight”! The picture above shows both front and back covers. The photograph was taken by Janet Faulk, and the design of the book was done by Martin Romero.